It's been a bit of a long day. I slept in until almost 07:30 this morning, then made the usual trek out to the convention centre on the subway, buying some sushi packs from the 7-11 again for breakfast, as well as an intriguing looking baked good labelled as a "cheese mushicake". It was almost savoury cheesy in a slightly unpleasant way that didn't approach the niceness of cheesecake, and I didn't finish it. I sat inside the convention centre to eat this morning as it was really cold out today. The meetings today were considerably more disagreeable than yesterday. No real heated argument, but certainly some frustration by different delegates that we couldn't agree on certain technical points about various proposed standards. I won't go into too much detail here. The lunch break was a bit shorter, so today several of us just went to the restaurant in the convention centre. Their menu was fairly uninspiring, but I chose a katsu curry with rice, which had sliced mushrooms in the sauce. It was a typical Japanese curry and reasonably good. After lunch were some more technical sessions, finishing at 16:30 in time for us to leave on a bus at 16:45 for the Sapporo Beer Museum and Beer Garden restaurant for the social event of the meeting. The weather outside had turned frigid and as we arrived there was a light sprinkle of rain, which Jackson described as ice particles and even snow, but I'm sceptical that it was that cold at all. It just felt like a drizzle with a brisk wind to me. 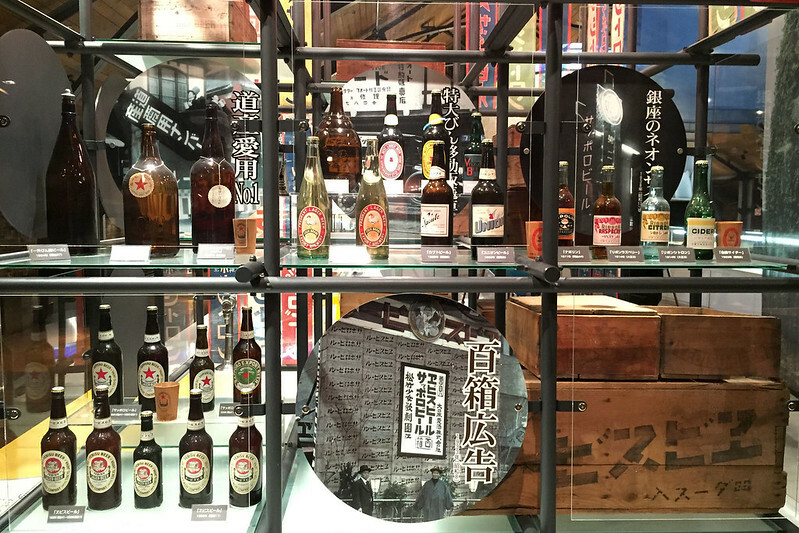 Display of historical beer bottles at Sapporo Beer Museum. 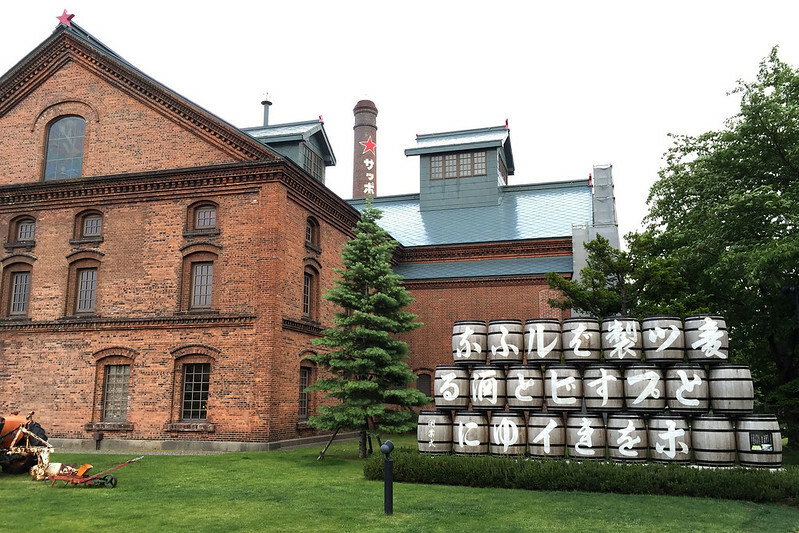 We got a guided tour of the beer museum in Japanese, with English brochures handed out to the English speakers. Our guide was an animated young woman who was clearly telling entertaining stories in Japanese. At the end of the tour she demonstrated how to pour a Sapporo beer properly into a glass, to achieve a dense foamy head, which garnered applause. Eric got to sample the beer, instructed to sip first for the can, and then from the glass to taste the difference. With the tour over we waited near the gift shop for the other working groups of this meeting to finish their tour - they'd arrived on a second bus a bit later than us. Then it was a short walk over to the restaurant for dinner. 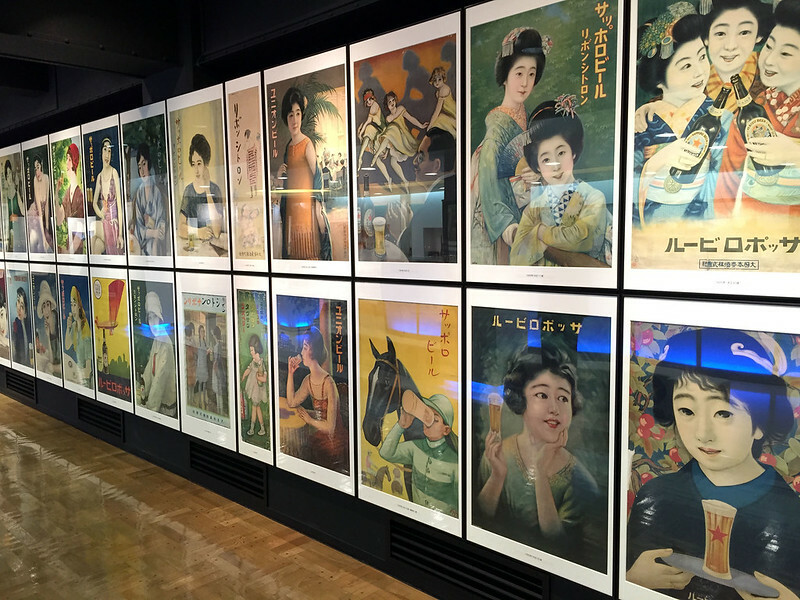 Display of historical beer posters at Sapporo Beer Museum. The tables had hotplates in the centre and a big plate of raw vegetables and another of thin slices of lamb. I sat with Jackson and Toru, who engaged in the cooking with some experience. There was also a small side dish of salad things, and a bowl of sauce for dipping the hot vegetables and meat in. 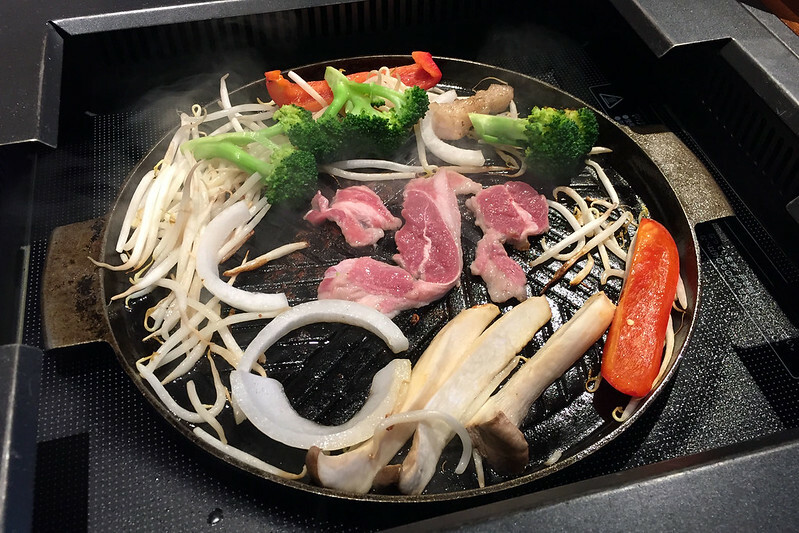 This lamb barbecue is a local Sapporo specialty known as jingisukan. We filled up on all the food, as well as large mugs of beer. Then when we were done and thinking it was time for a small dessert, they brought out more food! There were crab croquettes, which were large and delicious. And then more food! A paella-like plate of fried rice with prawns and tiny whole fish in it. We couldn't finish this, which was probably the signal that we didn't need yet more food. This ended the meal, as dessert was not provided. Jingisukan cooking at our table at Sapporo Beer Museum restaurant. During the meal there were a few short speeches from the organisers and chairs, and also a musical performance by one of the Japanese experts on a guitar, and the woman who had helped organise the meeting on a traditional Japanese three-stringed instrument. The man performed a song from My Fair Lady, while the woman performed two Japanese songs, one of which was accompanied by the man on a flute-like instrument. We broke up to head back to hotels a bit after 20:00. Most people got taxis, but I decided to walk. It was very cold, but not raining. The walk was about 30-40 minutes, but I stopped in a pharmacy that I passed to get some antiseptic and band-aids for my stitches that I have to remove today or tomorrow. Further on I realised I needed scissors too, and stopped in a convenience store which happened to have a small grooming kit with pointy scissors and tweezers - absolutely perfect. I felt like a sweet bite, so stopped in a Starbucks near my hotel to get a slice of chocolate cake. It was rich and delicious. Then I had a shower and caught up on reading and writing before bed. Still not sure if I'll try to remove the stitches now or tomorrow. The bandages are all off and the wound looks okay, so I don't think there'll be any problems.